When Should I Call the Doctor About Hypercalcemia? What Are the Exams and Tests for Hypercalcemia? What Are Home Remedies for Hypercalcemia? What Is the Medical Treatment for Hypercalcemia? What Are the Medications for Hypercalcemia? Is There Surgery for Hypercalcemia? What Is the Follow-up for Hypercalcemia? How Can I Prevent Hypercalcemia? What Is the Outlook for Hypercalcemia? One of the minerals that are important in the regulation and processes of many body functions including bone formation, hormone release, muscle contraction, and nerve and brain function is calcium. If levels of calcium in the body are elevated above what is considered normal, this is referred to as hypercalcemia. Calcium levels in the body are tightly regulated. The regulation of calcium is primarily controlled by vitamin D, calcitonin, and parathyroid hormone (PTH). Vitamin D is obtained through a process that begins with sun exposure to the skin. The process then continues in the liver and kidneys. Vitamin D can also be found in foods, such as eggs and dairy products. 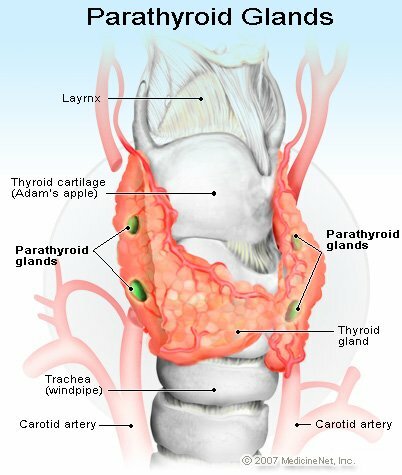 Parathyroid hormone is a hormone produced by the parathyroid glands, which are four small glands surrounded by the thyroid and found in the anterior part of the lower neck. Together, the parathyroid hormone, calcitonin, and vitamin D regulate calcium levels in the bloodstream via the kidneys and the intestinal tract. The most common cause of high calcium levels (hypercalcemia) is an overproduction of parathyroid hormone, or hyperparathyroidism. Hyperparathyroidism tends to be more common in women. Hyperparathyroidism can be the result of all four parathyroid glands producing an excessive amount of parathyroid hyperplasia (PTH), or the result of just one gland specifically producing an excessive amount of PTH (usually the result of a parathyroid adenoma or benign tumor). Other medical conditions can be associated with high calcium levels (non-parathyroid hypercalcemia). Some of these conditions are not serious; however, they may vary in severity and chronicity. For example, hypocalciuric hypercalcemia is an inherited condition in which individuals do not excrete normal amounts of calcium, thus calcium levels are usually slightly elevated. Patients with hypocalciuric hypercalcemia have little or no symptoms so it is generally discovered incidentally through routine blood tests. Other causes of hypercalcemia can be life-threatening. Cancers are commonly associated with elevated calcium levels and are referred to as "hypercalcemia of malignancy." Twenty to forty percent of patients with cancer will develop hypercalcemia at some point in their disease. use of certain medications such as thiazide diuretics. Signs and symptoms of hypercalcemia in most patients are minimal; however, as the level of calcium increases, the symptoms will be more pronounced. Acute (rapid) increases in calcium levels will cause more severe symptoms. For example, with dramatically elevated calcium, abnormal electrical impulses in the heart and arrhythmias (abnormal heart rhythms) can occur. In fact, there is a specific pattern on an electrocardiogram (EKG) associated with high levels of calcium. Because of the clinical findings were seen in hypercalcemia, the symptoms are often described as "moans, stones, groans, and bones." Extreme elevations in calcium levels may cause coma. Any family history of hypercalcemia should be brought to your physician's attention. If there is an underlying condition that causes high calcium levels (such as those mentioned above), calcium levels should be checked, particular if symptoms are occurring. If any of the above signs or symptoms occur, but without a known cause, the possibility of hypercalcemia should be discussed with your health care practitioner. A simple blood test provides the diagnostic information needed for hypercalcemia. Diagnosing the causes of hypercalcemia is often more difficult and complicated. A detailed history and physical examination are required in addition to other tests, such as additional blood tests (typically to check PTH and vitamin D levels), urine evaluation (urinalysis), X-rays, and other imaging procedures. If a patient is bedridden at home, changing positions frequently and physiotherapy can be helpful in preventing calcium rise secondary to immobility. Treatment of hypercalcemia depends on two main factors. If hypercalcemia in a patient is causing severe symptoms or if the values are critically elevated, lowering the blood calcium levels may require hospitalization and the use of hydration, steroids, or even dialysis. Intravenous medications can be used to lower the patient's calcium levels. Treatment with medications can be administered to the patient on an out-patient basis if the hypercalcemia state is modest. As mentioned previously, medication treatment depends on the underlying cause and the severity of the condition. If the cause is known, medications and treatment are aimed toward the underlying cause. Oral and intravenous medications can be used in the treatment of hypercalcemia; however, some may require a hospital or monitored setting. If the underlying cause is hyperparathyroidism (particularly from an adenoma), there are certain criteria that are reviewed to discuss if surgery should be considered. These criteria include the absolute calcium level, a history of kidney stones or other calcium-related complications, and the amount of calcium measured in a 24-hour urine collection. Based on these findings, surgical removal of the adenoma may be considered. Follow-up with the patient's treating physician is necessary for both the underlying condition and hypercalcemia. Hypercalcemia cannot be prevented, but early detection of the condition allows for normalization of calcium levels and leads to an early medical evaluation to determine the cause. If there is a known family history of hypercalcemia or hyperparathyroidism, the patient should tell the treating health care practitioner. Together, the patient and health care practitioner can determine if screening is warranted. The results of treatment for hypercalcemia depend on the underlying cause of the condition. If hypercalcemia is seen in the presence of cancer, the average 1-year survival rate is less than 30%. The prognosis is excellent for many of the other causes of hypercalcemia, if the underlying cause is diagnosed and treated. Please describe your experience with Hypercalcemia. What was the treatment for your Hypercalcemia?